With a diameter of 3,200 miles, the moon Titan is Saturn's largest satellite and the second largest in the whole solar system, after Jupiter's moon, Ganymede. It is fractionally bigger than the planet Mercury. Indeed, in some respects, Titan is more like a planet than a moon. It has a dense atmosphere (the only natural satellite to possess one) and surface liquid in the form of lakes (the only object other than Earth to feature this). It lies 759,272 miles out from Saturn (it's the innermost of the two large outer moons) and orbits its host planet in just under 16 days. As you can see, the dense atmosphere causes the moon to be a featureless orange globe. Little was known of what lay beneath these clouds until NASA sent space probes to check it out more closely. It was discovered that the moon Titan has a climate and, as a result, many Earth-like geographical features. 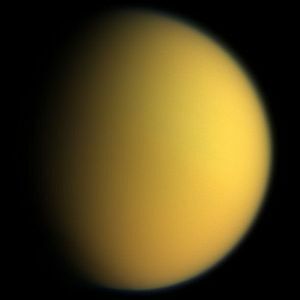 Titan's atmosphere extends at least 600 miles into space and is a thick mixture of mainly nitrogen, plus traces of methane and hydrogen. As stated above, this is the only example of a substantial atmosphere on any object in the solar system, apart from Earth. Titan's atmosphere is actually denser than our home planet and atmospheric pressure at its surface is one and a half times greater than Earth's. It is said that, because of this, coupled with the moon's low gravity, a human on Titan would be able to fly, just by flapping his arms! It has been observed that Titan's atmospheric layer rotates at a much faster rate than the moon itself, a property it shares with the planet Venus. Because of this dense atmosphere, the moon Titan has its own climate. Just like Earth, it features clouds, wind and rain. Unlike Earth, however, the clouds and rain are made up of organic compounds such as methane and ethane. 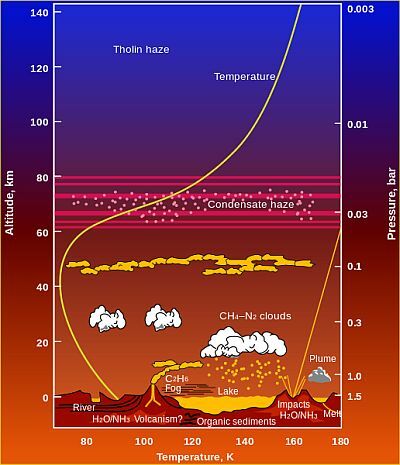 This graphic shows quite nicely the different aspects of Titan's climate, using chemical formulae. Here's a translation: CH4 is methane; C2H6 is ethane; NH3 is ammonia; N2 is nitrogen and, of course, H2O is water. So, clouds of methane and nitrogen will produce rain, which reaches the surface, forming methane lakes. 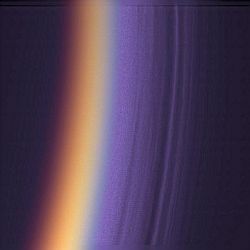 You can also see in the diagram that the topmost layer of Titan's atmosphere is a "Tholin haze". Tholins are complex molecules formed by the action of ultraviolet rays from the Sun on methane or ethane and are an orangey-brown colour. 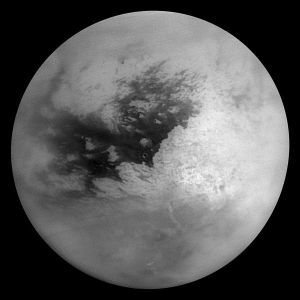 This accounts for the appearance of Titan when viewed from space. 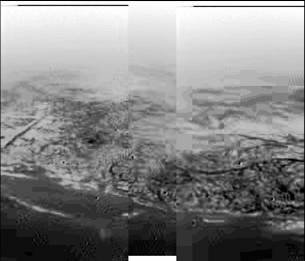 The Cassini probe, during its many flybys, surveyed the surface of Titan in a variety of ways, managing to obtain an image of it without its obscuring atmosphere. It was discovered to be quite a smooth surface with large areas of dark terrain. One such area - "Shangri-la"
These dark areas were, at first, thought to possibly be oceans of liquid methane, but closer observations have revealed that they are vast plains, consisting of huge sand dunes, over 1,000 feet high, three quarters of a mile wide and between 10 and 100 miles long. Regarding the rest of the moon, there are many Earth-like geographical features. 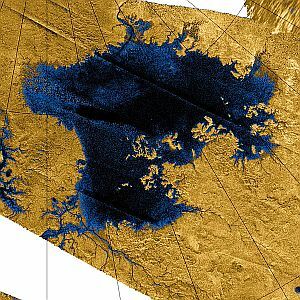 Although it has been conclusively proved that the moon Titan doesn't feature full sized methane oceans, it does boast a selection of lakes. There are three extremely large ones and, despite what I've just said, they've been termed "seas". There are some 35 examples of these bodies of liquid methane or ethane and their depths can range from 10 to 26 feet. The moon also features methane rivers. Ligeia Mare, pictured above, has a river flowing into it that is over 250 miles long. There are also examples of dried river beds. Although the moon Titan's surface is generally quite smooth, it does have its share of mountains. In 2006, Cassini discovered a mountain range in the moon's southern hemisphere that is 93 miles long, 18 miles wide and almost one mile high. It is thought that any mountains were formed under the same process as those on Earth. There is also tentative evidence of possible cryovolcanism, though this has not been conclusively proved. A "cryovolcano" is simply one that spews out material other than molten lava, as Earth's volcanoes do. In this case, it would be water and ammonia. 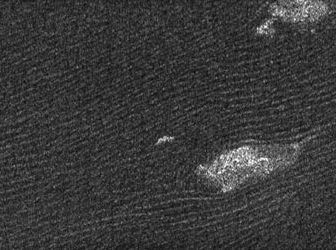 Surprisingly, the moon Titan has very few impact craters. A notable one discovered by Cassini is Minerva, which is 273 miles wide. Many craters are very faint and this is probably due to wind erosion. It is thought that Titan consists of both water ice and rock in equal quantities. Various studies of the moon suggest that it has a huge core of over 1,000 miles radius. Above this core are various layers of different versions of water ice. As the core is quite hot, it enables the possible existence of a subsurface ocean, consisting of a mixture of water and ammonia. 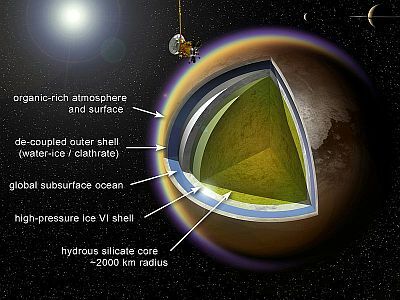 Subsequent observations by Cassini suggest that the crust is not solidly connected to the interior, making the presence of this ocean probable rather than possible. 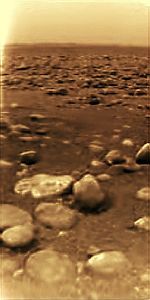 At the end of 2004, the Cassini probe discharged a lander called Huygens to actually make its way down to Titan's surface. On January 14th, 2005, it touched down, making it the only man-made object to ever land on a heavenly body further out in the solar system than Mars. It revealed some very Earth-like features. After landing, the view revealed a plain strewn with rocks. Any soil-like material in the image is formed from "drizzle" from the methane clouds. The landing site was named the Hubert Curien Memorial Station in memory of the one-time president of the ESA.